Wildlife management unit #511 is a no-baiting zone. 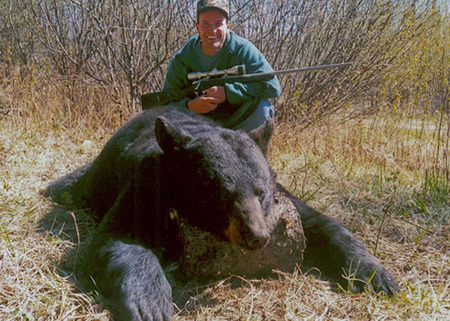 Hunting is generally done by using Trucks or ATVs to go to areas of natural vegetation which the bears feed on. Once there we spot and stalk, blind or tree stand hunt, or call bears to the hunter. The areas continually change due to changes in vegetation locations from year to year so our guides are continually on the look out for new and better concentrations of bears, sign, or feed vegetation types. The weather can be anything from a balmy 80-85 F. to a foot of snow and 20 degrees F.
We generally do not have a lot of rain but occasional showers can be chilly. Bugs are usually not a problem but the odd evening can see a few of the pesky critters around in late May. Clothing is always a question and we suggest bringing clothes which can be layered with a good pair of water proof hiking boots (400-800 gr. Insulation) and a pair of felt lined rubber boots. Camo design (if desired) should be for a boreal forest setting in the green up of spring. The base camp is generally a bush tent camp with bunk beds and wood stoves providing a clean dry setting for yourself and your gear. Bedding can be provided however most hunters like to bring their own sleeping bag (please clarify your needs with us before coming). The scenery is gorgeous at this time of year with the country going from brown to lush green in just a short couple weeks. 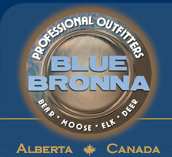 When ever more than two hunters are in camp (we generally have 4-6 hunters per camp) Blue Bronna has a cook on staff. A typical day starts around 10:00 A.M. with a brunch followed by skinning bears from the previous night, or fishing. Some hunters like to go out and hunt from noon to three followed by a meal and serious hunting taking place from 4-11 o’clock P.M. Usually another meal and socializing wrap up around 1:00. Typically we have hunters fly into Slave Lake or we can meet you in Edmonton and arrange for a vehicular pick up. The drive from Slave Lake to our base camp is about 50 minutes or 3.5 hours from Edmonton to the base camp. Upon arrival in Edmonton we usually use the Nisku Inn (780 955 7744) or the Executive Royal Inn (780 986 1840). Meat care – $2.00 per pound. If you intend to leave your meat here, or give it away, it must go through a processor, the cost of which is approximately $2/lb.